My most recent posts were months and months ago. In them I explained that I have been busy meeting my ordinary obligations, teaching, commuting, and especially trying to catch-up on scholarly publishing. I never will be completely ahead of the game, but I have managed to receive acceptance letters for four peer reviewed scholarly journal publications and two graduate teaching awards in the time that has transpired since I took a long break from the ChangeInTerms.com Website. So, bad news for some banks that do not like the opinions expressed on this site about the abusive treatment of their customers: I have not died yet, and I am not blind to your bad behavior, and I am still watching you. Moreover: Now I’m (Still) Coming After You. Besides credit card customer abuses, impacting both consumer and small businesses, Chase is also still at the top of my own personal list of the most egregious abusers in the mortgage arena. Because practically every other commercial aired on TV news channels seems to be from Chase, I don’t think it’s much of a leap to assert that the financial incentive its advertising schedule provides likely has an impact on what news coverage we do and do not see. I think Chase’s advertising dollars have certainly had an influence in a tendency toward “buying off” the mainstream media. As an example, I have only seen barely a smidgen of CNN coverage on what Chase did to military families. In case you’ve already forgotten (for lack of coverage), I have not. Moreover, foreclosing on ANY of them, and overcharging thousands of them was horrible. Don’t you get it Chase? We’re not accounts, we’re human beings. Meanwhile, if I watch CNN for an hour or two, it repeats some stories over and over and over again in that same time-frame. But on the day I saw a mention of Chase’s foreclosure story on military families, the story seemed to be very short, and I did not see it repeated again at all (which was glaringly noticeable given the typical incessantly repetitive style of CNN coverage I have observed). Humm, go figure. Time’s up. The answer is obvious. No media outlet is going to mess with one of its major advertisers. My father (now deceased) was a fighter pilot and served his country honorably until his retirement as a Lieutenant Colonel. As a small child, I remember his deployment in the Middle East. In fact, my mom recently gave me a box that made me cry. It was filled with military pins, patches, postcards from foreign countries, his Air Force gloves, and other reminders of his life and mine. These military memorabilia from my dad also made me think of Chase. I don’t think that Chase has exhibited the one value that is needed to justify its continuation as an institution: honor. What Chase did to these military families turns my stomach. In other news, Bank of America, you’re “on my list,” too. You’d better recognize that when you send change-in-terms notices to me (four recently), I will read them. I’ll be getting back to you on that. 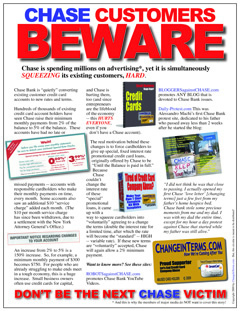 Posted in: Credit Cards Coverage in the Media, Editorial-Opinion, Join the Fight. ← Have you been solicited for a small business/professional credit card? Hi Robert, why don’t you put your three books just below your articles. They are buried so far down the page that I doubt they are seen by most visitors. I hope you get a chance to see http://www.occupynews.net, you may be pleasantly surprised at my moderate stance. Hi Robert, after several years and reading over a thousand articles about banking practices, I think I have finally figured out what makes the banking industry so ruthless. It’s an amazingly short three paragraph article but it spells out the underbelly of why banks act the way that they do, and this short three paragraph article offers a solution as well. Would love to have you add my two newest blogs, http://www.occupynews.net and http://www.bankprotests.com to your link list. All of this is “HUGE NEWS” except in the mainstream media (again, still). It deserves a ChangeInTerms.com headline post, and I will try to get to that. Great to see you are back and still after them. Still working on local news and politicians, but they are paying out a lot of cash the pols. Union collusion with companies is now a new challange for me.